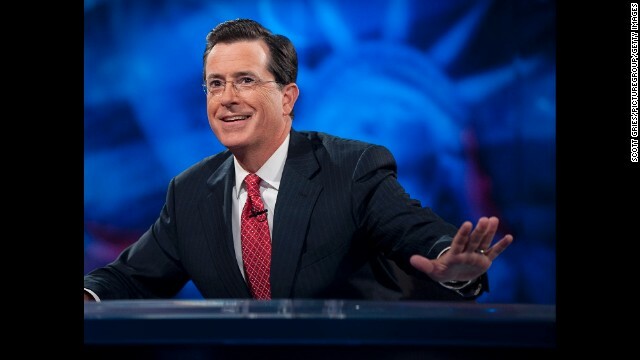 Stephen Colbert will take over "The Late Show" upon the retirement of David Letterman in 2015. Colbert's rise includes a number of notable moments. 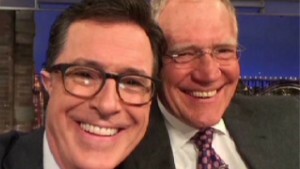 Colbert, left, was originally one of "The Daily Show's" correspondents. He began with the show during its Craig Kilborn era and stayed when Jon Stewart, center, came to host in 1999. Others on the show included, from left, Ed Helms, Rob Corddry and Samantha Bee. 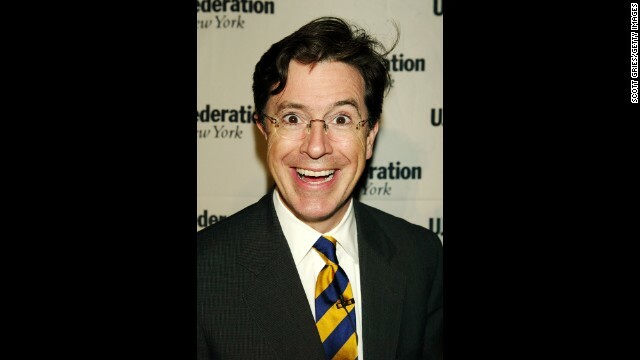 While appearing on "The Daily Show," Colbert was also part of the cast of "Strangers with Candy," a comedy series with Amy Sedaris and Paul Dinello. He met the pair while he was a member of the Second City comedy troupe in the early '90s. 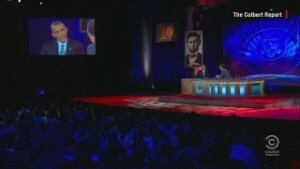 As a "correspondent" and later an anchor, Colbert developed a character that has been, at turns, pompous, pious and egocentric -- basing the persona on many others in television. 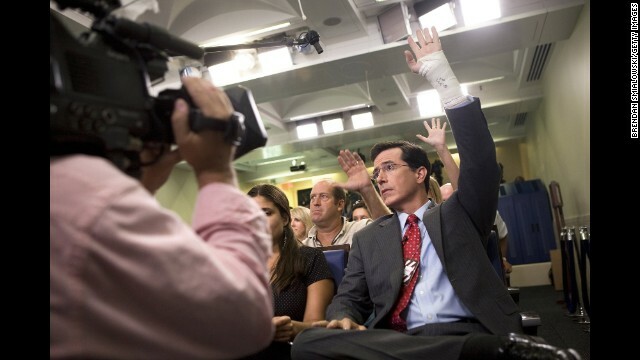 As correspondent, Colbert was key to "The Daily Show's" election coverage. Here he takes part in Election Night 2004. 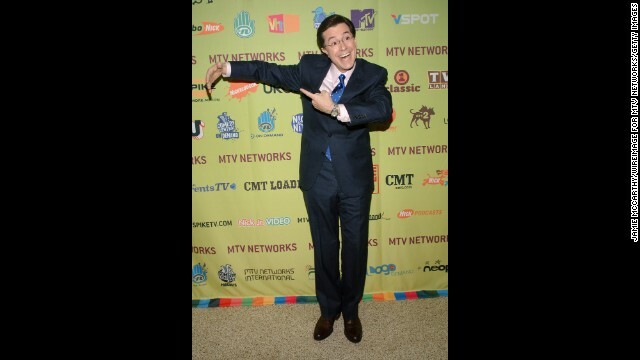 Colbert's work on "The Daily Show" contributed to a number of awards -- including several Emmys. He poses here with, left to right, Rob Corddry, host Jon Stewart, Ed Helms and Samantha Bee. 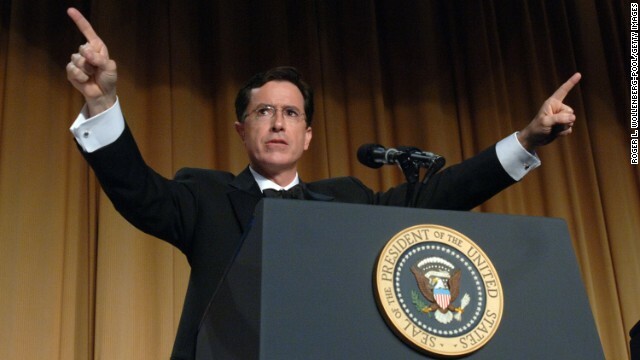 Colbert earned praise -- and notoriety -- for his hosting of the 2006 White House Correspondents Dinner. In character, his barbs about President George W. Bush and the political news media drew blood. On "The Colbert Report" -- and that's pronounced "Col-bear Rap-pour" -- Colbert highlights the foibles of politicians with such segments as "Better Know a District," a proposed 435-part series in which he offers a take on every House District. The representatives he interviewed sometimes haven't been aware of the joke. 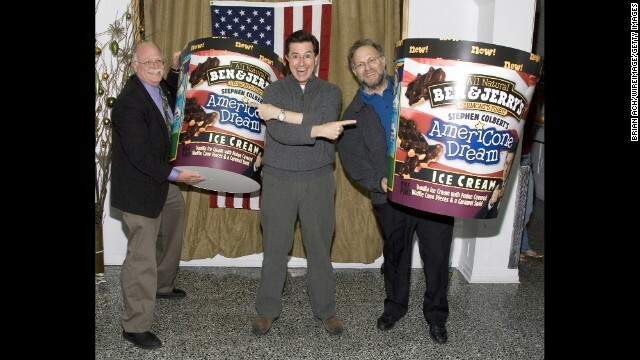 Very quickly, Colbert's influence rose so high that he got his own Ben & Jerry's ice cream flavor: AmeriCone Dream. Here he poses with Ben Cohen, left, and Jerry Greenfield at the flavor's launch party. The White House hasn't been immune to Colbert's charms. He showed up for a mock press conference in 2007. 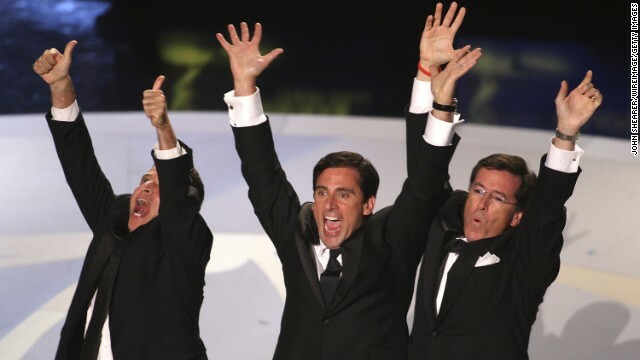 "The Daily Show" may have won a bunch of Emmy awards, but in 2013 "The Colbert Report" broke its streak of 10 straight awards for outstanding variety series. It's also won two Emmys for writing, as well as two Peabodys. 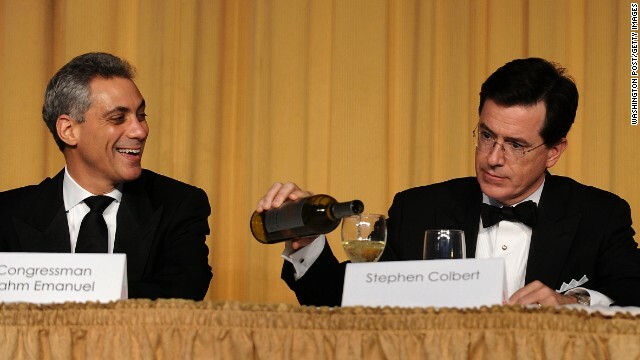 Colbert hosted a roast for then congressman -- and later Chicago mayor -- Rahm Emanuel in 2008. 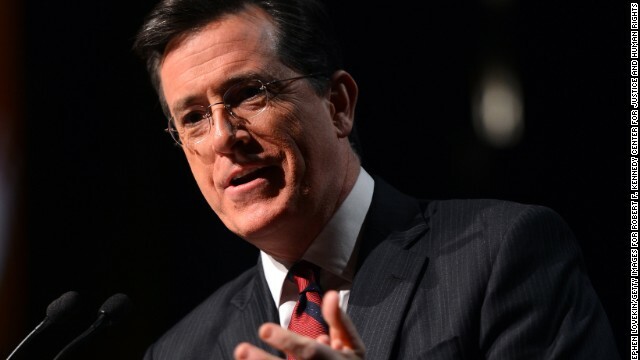 Colbert, a South Carolina native, has ties with Chicago, having gone to college at Northwestern, in nearby Evanston, and worked in the city's comedy scene. 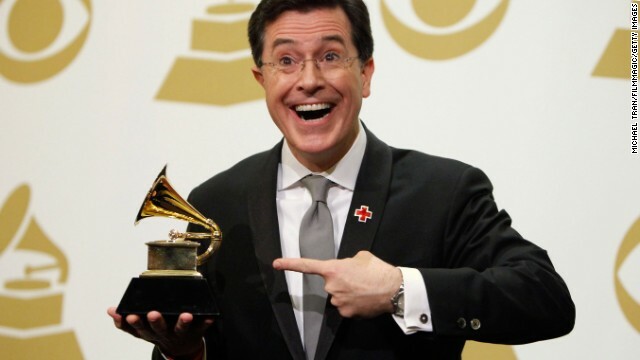 Colbert's awards haul isn't limited to Emmys and Peabodys. In 2010 he won a Grammy for his Christmas album, and four years later won another for best spoken-word album. 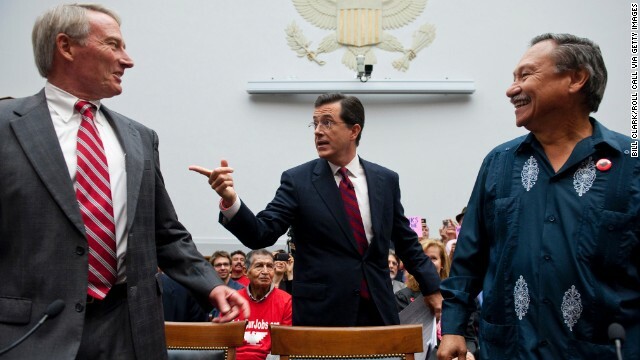 In September 2010, Colbert testified at a hearing on immigration. He took time to chat with Phil Glaize, chairman of the U.S. Apple Association, left, and Arturo Rodriguez, president of the United Farm Workers. Again, some representatives didn't get Colbert. In October 2010 Colbert teamed up with Stewart for a Washington rally, "Rally to Restore Sanity and/or Fear." Stewart handled the sanity; Colbert took care of the fear. The rally was a response, sort of, to rallies led by Glenn Beck and Al Sharpton. 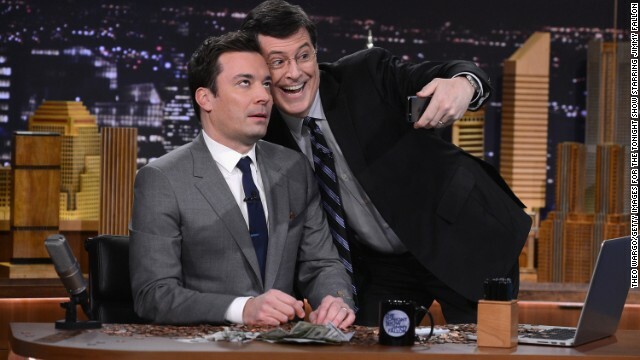 Colbert's character definitely loves himself. 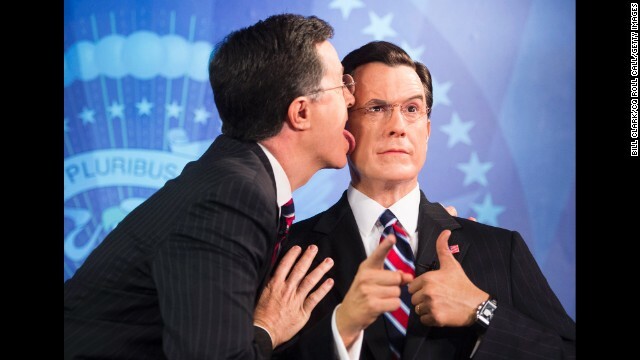 He went so far as to lick himself during the unveiling of his wax figure at the Madame Tussauds wax museum in Washington in 2012. 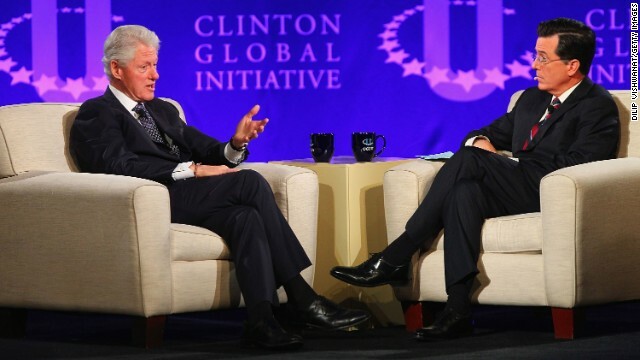 Colbert may be responsible for Bill Clinton being on Twitter. When the former president appeared on his show in 2013, Colbert set up an account, @PrezBillyJeff. Clinton later set up his real account, @billclinton. Colbert, a devout Catholic, has taught Sunday school and talked about social justice. He spoke at the Robert F. Kennedy Center for Justice and Human Rights 2013 Ripple of Hope Awards dinner. Colbert faces a changed talk-show landscape. Jimmy Fallon, left, has gotten off to a fast start as new "Tonight Show" host on NBC, and ABC's Jimmy Kimmel also has a strong fan base. Observers are curious whether Colbert will bring his character with him to "The Late Show." We'll find out when David Letterman steps down. 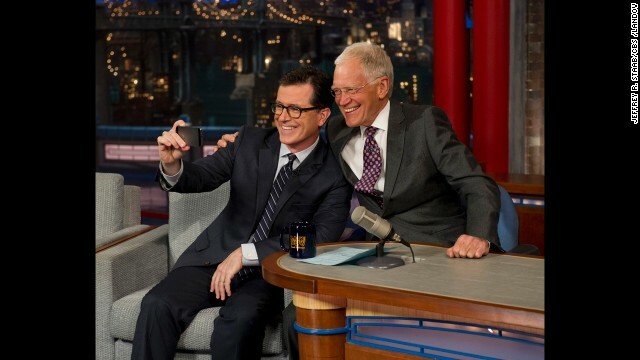 Colbert takes a selfie with Letterman on the "Late Show with David Letterman" on Tuesday, April 22. CBS began to introduce the next host of the "Late Show" by having its current host interview him. On December 18, we'll have to say goodbye to the political character, "Stephen Colbert"
When Colbert takes over David Letterman's show, will he be as funny as his fictional persona? Editor's note: Dean Obeidallah, a former attorney, is a columnist for The Daily Beast and editor of the politics blog "The Dean's Report." He's also the co-director of the documentary "The Muslims Are Coming!" Follow him on Twitter: @TheDeansreport The opinions expressed in this commentary are solely those of the author. (CNN) -- Come December 18, we'll have to say goodbye to our favorite blowhard political character, "Stephen Colbert." That's the day the real Colbert will retire "Colbert" the character as he signs off from his Comedy Central show, "The Colbert Report," in preparation to take over for David Letterman in 2015. For all of us Colbert fans, it feels like losing an old friend who we've grown to know, laugh with (and at) over the past nine years. You see, when Colbert takes over Letterman's show next year, he will no longer be "Colbert," but rather the real Colbert. But here's the thing: What happens if we don't find the real Colbert as entertaining and engaging as the fictional "Colbert"? After all, "Colbert" is a bigger-than-life character and the reason his humor works so well is because it's delivered in a comedic voice. "Why would we go to war on women? They don't have any oil." "Contraception leads to more babies being born out of wedlock, the exact same way that fire extinguishers cause fires." "If we don't cut expensive things like Head Start, child nutrition programs, and teachers, what sort of future are we leaving for our children?" "Join me in standing up against any actual knowledge about guns. Let the CDC know they can take away our ignorance when the pry it from our cold, dead minds." These jokes aren't nearly as funny -- if funny at all -- if not told via "Colbert," complete with his pompousness, arching eyebrow and screaming eagle. Therein lies Colbert's challenge. Now, before my fellow Colbert fans turn on me, I'm not suggesting Colbert isn't capable of being funny outside of "Colbert." He's truly an immensely talented performer who trained at the famed Second City in Chicago and has been making us laugh for years. 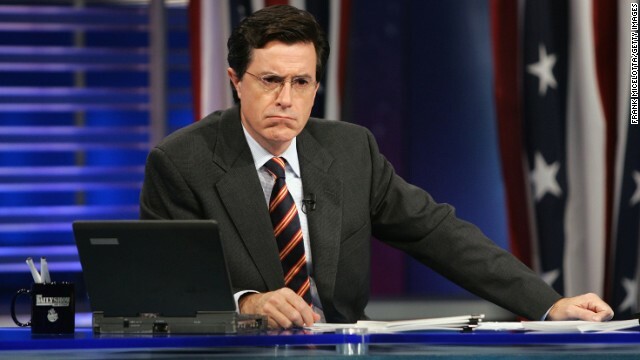 But why drop "Colbert" when it's that very character that got Colbert the "Letterman" gig in the first place? Please don't tell me it's in response to the views of people like Rush Limbaugh -- an unintentional "Colbert" -- who remarked when Colbert was announced as Letterman's replacement: "CBS has just declared war on the heartland of America. No longer is comedy going to be a covert assault on traditional American values, conservatism. Now it's just wide out in the open." And that's a real concern for CBS since Letterman's show in 2013 reportedly garnered $179 million in ad revenue for the network. No one at CBS wants that figure to go down. But those same TV executives should keep in mind that in the sweeps ratings period in May, "The Colbert Report" was almost tied with the number of viewers "Letterman" attracted in the coveted 18-49 age demographic. And Colbert's reach will be even greater when he moves to network TV and is no longer just on Comedy Central, which reaches only 85% of the country. To be candid, I have another concern about Colbert dumping "Colbert." I was watching some clips of Colbert being himself. He comes across as thoughtful, well-spoken and analytical. Those are admirable qualities in the real world, but not so much for a TV personality who will have to carry a weekly late night comedy show. We aren't talking "Charlie Rose," we are talking a late-night comedy show where the competition for viewers is fierce. For example, I watched an interview of Colbert by the late Tim Russert on "Meet the Press" in 2007. Colbert was low energy and pleasant. But I kept waiting for "Colbert" to emerge. I'm not in any way suggesting that Colbert needs to be a nonstop joke machine. 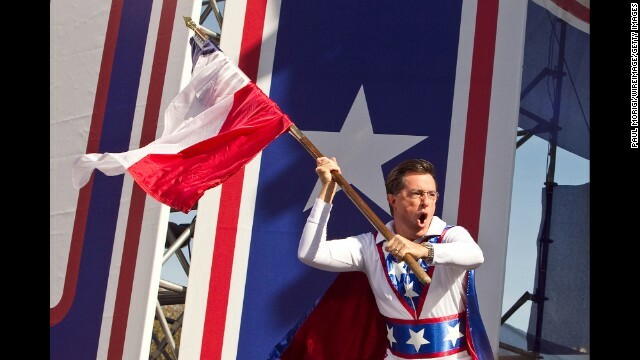 What I'm saying is that "Colbert" the character has set the bar high for Colbert the person. The success of "Colbert" is as much about the jokes that come out of his mouth as it's about his character's point of view, energy, mannerism, etc. And we Colbert fans, along with the far less friendly TV critics, will no doubt compare "Colbert" to Colbert when he takes the reins at his CBS show. Expect to see reviews that say along the lines of, "we miss 'Colbert'" or worse, "Colbert is not as funny as 'Colbert.'" But there's one bright spot for "Colbert" fans that Colbert told Russert. He mentioned being taught years ago at Second City to "wear a character as light as a cap," so that you can easily move in and out of it. That means "Colbert" will likely never be too far away from Colbert. Hopefully, that will mean that we'll see glimmers of our old friend from time to time.